Everyone knows I am a little bit of a wino. I love the taste, the fact that there are independently owned wineries all over California & I love even more that more & more wineries are opening up around the country. Love supporting local businesses. Anyone who has the balls to put themselves out there & start something deserves to be supported. Last year Chris & I started getting more & more into beer, for all of the same reasons. Breweries are popping up all over the country & a lot of breweries feature great pup foods & snacks. A few months ago we spent a long weekend in the West Palm Beach area of Florida. We were there for a wedding but my cousin moved there a few years ago so we spent a day with him & his wife brewery hopping to three different breweries. Two were seasoned breweries but one had just opened that week, which was pretty cool. They were each so different from their ambiance, to their taste. My favorite was probably Due South Brewing Company. A large 15,000 square foot brewery with an onsite taproom, private back room & yard games to play. Due South was the second gastropub we stopped at so we started by grabbing dinner at the food truck on our way in the door. We each got a flight & played a game of corn hole. Sounds like a perfect Saturday to me! If you talked to me 6 years ago I would say pass me a Michelob Ultra for the girlie taste & the $4 price tag. Now a days I’d like only a freshly tapped Double IPA with an amazing basket of sweat potato fries & pumpkin dip. I know, pretty specific. This recipe I kind of just winged. I tried it a few times, & it didn’t always work out. Chris ate it with a smile, but maybe he actually liked it. I didn’t though. So I changed it little by little each time I tried it & finally figured out how to make it so we both liked it. 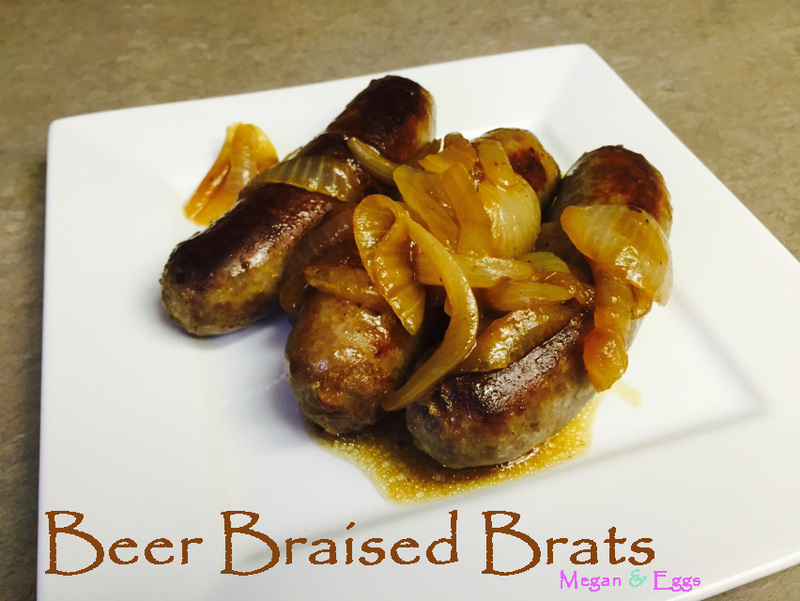 Crispy but still full of flavorful beer with an amazing caramelized onion flavor. Yum! I want to eat it right now. I hope you enjoy just as much as I do. 1. Heat oil on low. 2. Cook brats over low heat for about 5 minutes per side. Try to get as much of the surface spaced browned for an even cook. 3. Add onions and raise heat to medium. Cook down onion for about 4 minutes or until soft, but not translucent. 4. Add beer and cook covered. 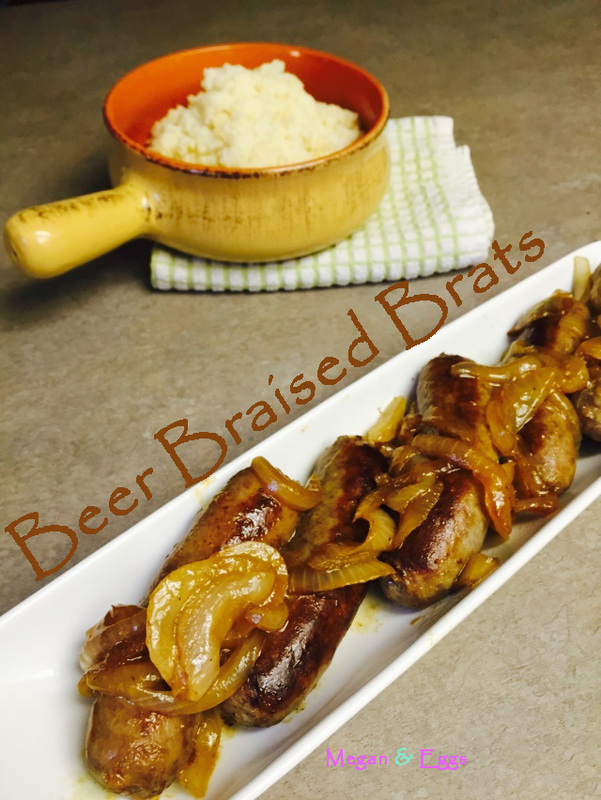 Allow beer to bubble up around brats. 5. Once beer is reduced to half, uncover and continue to cook until only a small layer of beer remains. Onions will be caramelized.